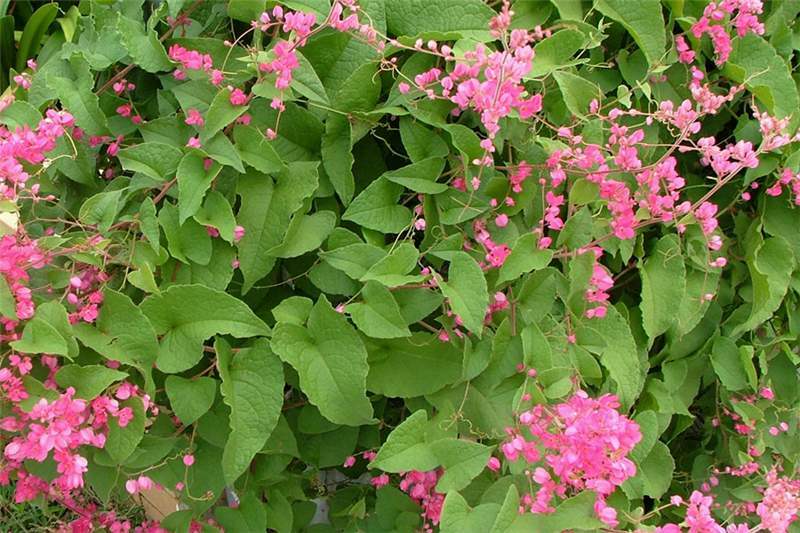 Coral creeper, bride's tears, chain-of-love, Confederate vine, coral vine, coralita, hearts on a chain, love-vine, Mexican creeper, Mexican love vine, mountain rose, queen's jewels. Locations within which Antigonon leptopus is naturalised include Africa, Asia, south-eastern USA and many oceanic islands with warm climates. 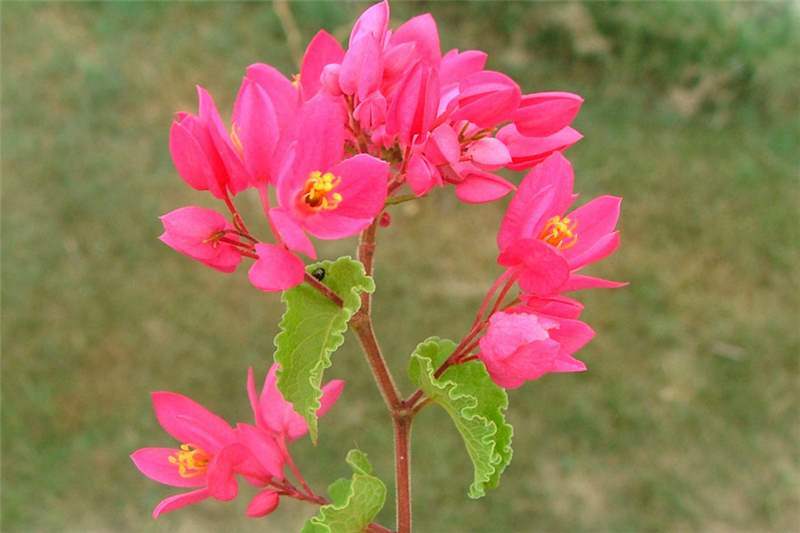 Antigonon leptopus has become invasive in parts of Kenya and has been introduced to Tanzania and Uganda (A.B.R. Witt pers. obs.). A weed of riparian zones (banks of watercourses), monsoon vine thickets, rainforest margins, coastal sand dunes, mangrove vegetation, roadsides, disturbed sites, waste areas and old gardens in the wetter tropical and subtropical regions. A long-lived (perennial) vine with stems often climbing up over other vegetation 6-10 m tall, occasionally reaching 15 m in height. It produces underground tubers and loses its leaves (it is deciduous) during the dry season in areas seasonal rains. The slender stems climb up or sprawl over other vegetation by means of tendrils that are borne in the leaf forks (axils). They are branched, angular in cross-section, and either hairless (glabrous) or sparsely to densely covered in brownish or reddish hairs (pubescent). Older stems may sometimes become brown and woody towards the base of the plant, while younger stems are reddish-brown or green in colour. 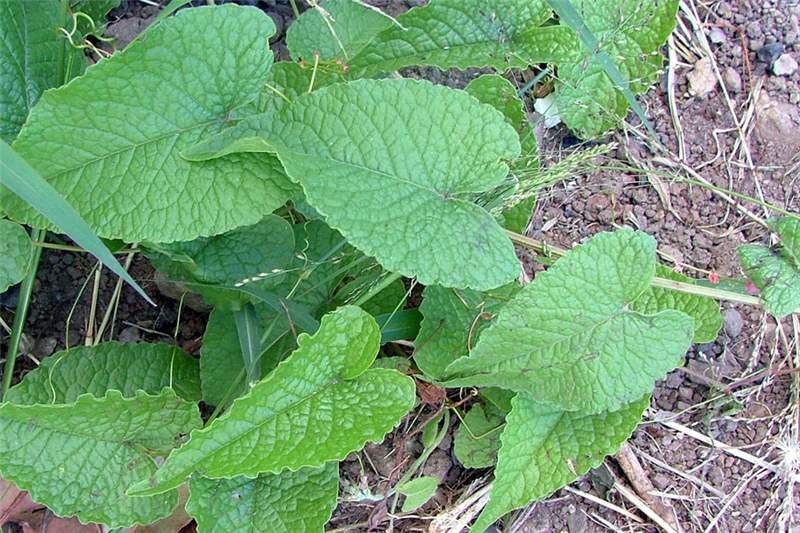 The alternately arranged leaves are simple and borne on stalks (petioles) 1-5 cm long. These stalks are sometimes slightly winged and have a very small membranous structure (ochrea) 0.2-2 mm long at their base. The leaf blades (2.5-15 cm long and 2-10 cm wide) are either egg-shaped in outline with broad end at base (ovate), heart-shaped (cordate) or somewhat triangular in shape. The lower ones are usually larger and broader, while the upper ones are smaller and narrower. These leaves may have either entire, wavy (undulate) or bluntly toothed (crenate) margins and the tips are usually pointed (acute to acuminate apices). They may be hairless (glabrous) or somewhat hairy (pubescent), especially along their veins on their undersides. The leaves are light to dark green in colour, have a strongly wrinkled (rugose) appearance, and are lined with a network of veins (they are reticulately veined). The flowers are borne in unbranched, or more commonly branched, clusters at the tips of the branches (in terminal racemes or panicles). These flower clusters (4-20 cm long) have hairy stalks (puberulent to pilose peduncles) and the flowers are arranged into small groups along the branches (with 1 to 4 flowers in each group). The tips of the flower clusters usually end in a short tendril. Individual flowers are borne on smaller stalks (pedicels) 3-10 mm long and each flower has five 'petals' (sepals or perianth segments) that are usually bright pink in colour, but may occasionally be white or reddish. These 'petals' (4-10 mm long and 2-6 mm wide) have entire margins and pointed tips (acute apices). They also have eight stamens and an ovary topped with three styles and stigmas. Flowering may occur throughout the year. The small brown fruit (achenes) are cone-shaped or three-angled (8-12 mm long and 4-7 mm wide) and shiny in appearance. 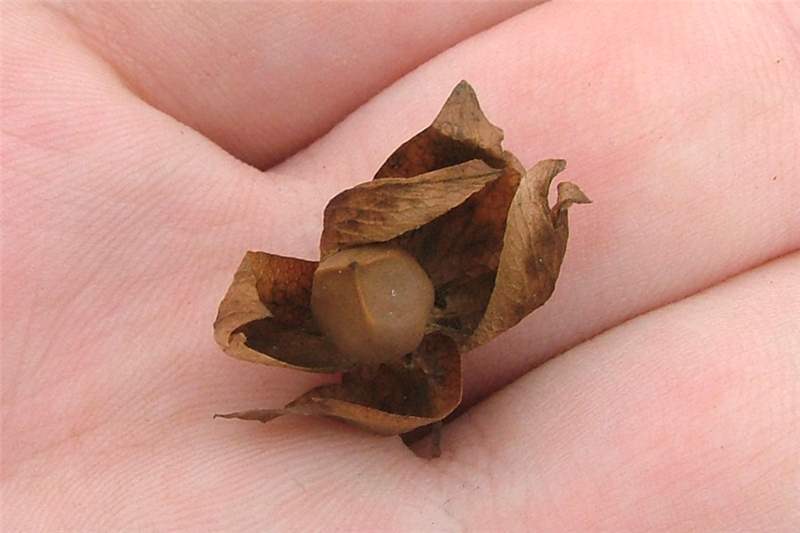 These fruit usually remain hidden within the enlarged and persistent remains of the 'petals' (8-20 long and 4-15 mm wide), which turn dull pink and then eventually brown as they age. Antigonon leptopus reproduces by seed and also vegetatively via tubers, root suckers and stem segments. The seeds float on water and may also be spread to new locations by domestic and wild animals that eat the fruit. Pieces of its trailing stems may be broken off and carried about during earthmoving operations and by floodwaters. Tubers and root segments can also be spread by the movement of soil. A. leptopus is a climbing plant with cordate, ovate or somewhat triangular leaves that have a prominent network of veins and a somewhat wrinkled surface (they are rugose). Most cucurbits have lobed leaves. Its flowers are usually bright pink in colour (rarely white or red) and are borne in large branched clusters at the tips of the stems (in terminal panicles). These flowers turn light brown as the fruit mature. 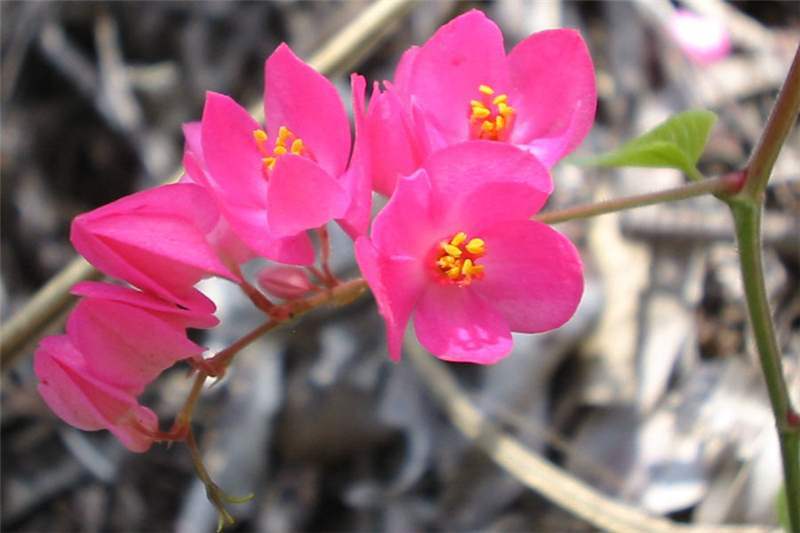 Antigonon leptopus is regarded as an environmental weed in many parts of the world. 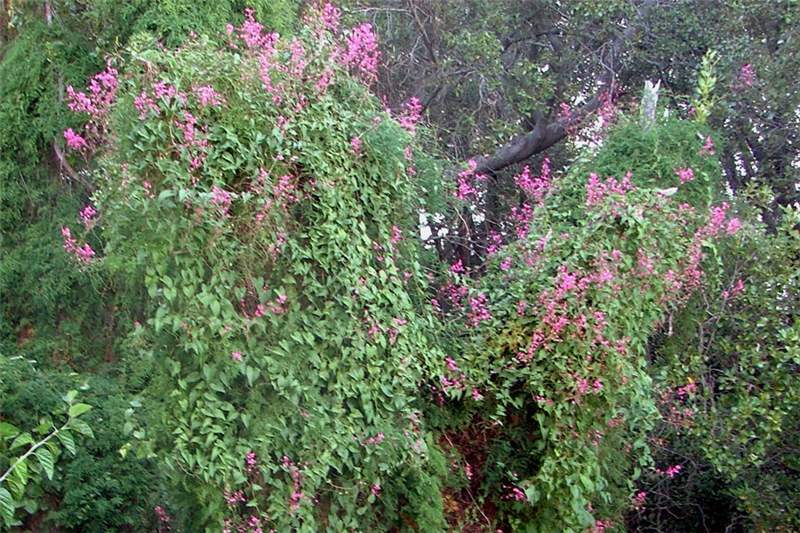 It can completely smother native plants, out-competing native vines and understory vegetation. In the wet-dry climate of northern Australia, its leaves dry out and drop during the dry season thereby providing fuel for damaging fires. It has become particularly invasive on several Pacific Islands, where it grows in disturbed areas and on dry coral cliffs. For example, it is extensively invading disturbed areas and forest edges on the northern half of Guam. It is also reported to be invasive on islands in the Atlantic (Virgin Islands) and Indian Oceans (e.g. Christmas Island and Timor). 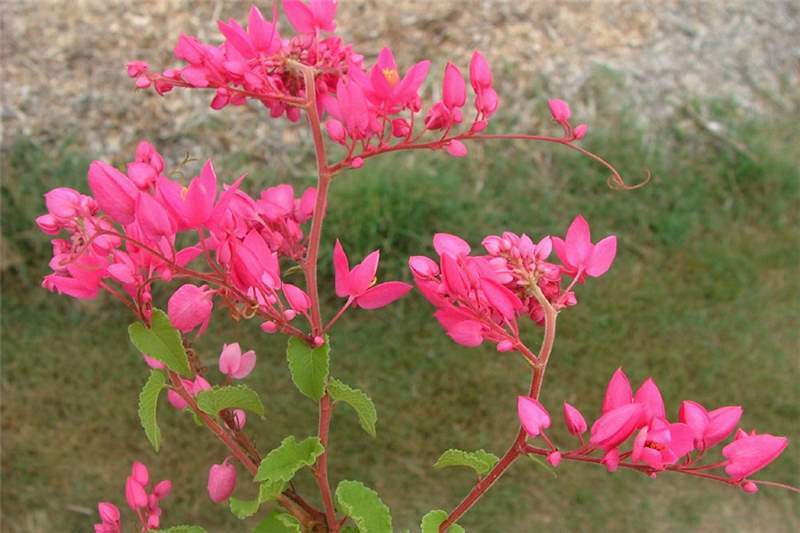 A. leptopus has been included in the Global Invasive Species Database (GISD 2010). The precise management measures adopted for any plant invasion will depend upon factors such as the terrain, the cost and availability of labour, the severity of the infestation and the presence of other invasive species. Some components of an integrated management approach are introduced below. Plants can be controlled by pulling plants and removing the underground tubers if this is carried out repeatedly for an extended period. Cutting alone is ineffective as the plants will re-sprout from the cut stems or underground tubers. Suitable herbicides can be used as a foliar spray. When using any herbicide always read the label first and follow all instructions and safety requirements. If in doubt consult an expert. The editors could find no information on any biological control agents for this species. A cultivar with white flowers (Antigonon leptopus 'Alba') is sometimes also seen in gardens, and a cultivar with dark red flowers (Antigonon leptopus 'Baja Red') is grown overseas. Germplasm Resources Information Network (GRIN). www.ars-grin.gov/npgs/index.html. National Germplasm Resources Laboratory, National Genetic Resources Program, Agricultural Research Service (ARS), United States Department of Agriculture (USDA), Beltsville, Maryland, USA. Accessed March 2011. GISD (2010). Global Invasive Species Database online data sheet. 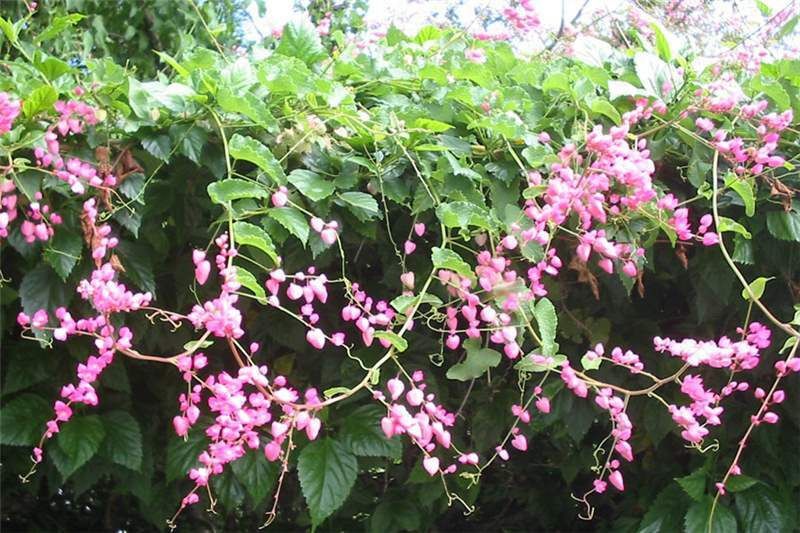 Antigonon leptopus (vine, climber). www.issg.org/database. Invasive Species Specialist Group. Accessed March 2011. Henderson, L. (2001). Alien weeds and invasive plants. A complete guide to declared weeds and invaders in South Africa. Plant Protection Research Institute Handbook No. 12, 300pp. PPR, ARC South Africa. Pacific Island Ecosystems at Risk (PIER). Antigonon leptopus Hook. & Arn., Polygonaceae. Pacific Island Ecosystems at Risk (PIER): plant threats to Pacific ecosystems. www.hear.org/pier/species/antigonon_leptopus.htm. Institute of Pacific Islands Forestry, Hawaii, USA. Accessed March 2011. USDA Plants Profile. Antigonon leptopus Hook. & Arn. 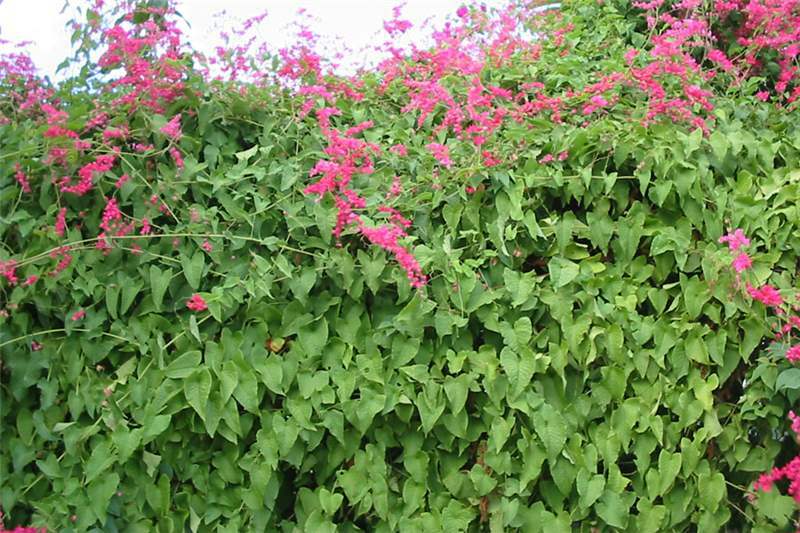 Coral vine. Plants Profile, The Plants Database. plants.usda.gov/java/profile?symbol=ANLE4. National Plant Data Center, National Resources Conservation Service, United States Department of Agriculture, Baton Rouge, Louisiana, USA. Accessed March 2011.